Sent you an email Zozee. Be on the lookout for it. Janice, I have not received a tracking number, and I am only in this one group. Our last full day in Paradise. Funny thing the resort provides shampoo and all the other goodies. Really loved how the gel held my hair in all the humidity. Looked closely at container and started laughing out loud. It was body gel for the shower. Oh well worked great on keeping down the friz. Favorite meal was my lunch desert. Homemade guacamole and fresh salsa with corn chips, yummy. All of the blocks you made are beautiful. I love the fabric you chose! All 26 packages are at the front door waiting for today’s pickup. By Wednesday, most of you will have your F8s. Yay! Big reminder for everyone, immediately after you open your packages, be sure to count your F8s. Almost everyone ein Sooner will have 19. Zozee and NK will have 13. You need to confirm this so there’s no question later. Be careful to separate them from your own fabrics. This round I’m using a beautiful gift bag to hold mine. They are always in there except when I’m working with them. Once a block is made, they get put back in. Use whatever system works for you but do keep track of all of them. Thanks! Oooh, I can't wait! I'm feeling like a kid waiting for Christmas. That made me smile, NZQ. I hope you enjoy your first Boom! I am so glad they will be here before my 4 day weekend, starting Friday. Here is what I worked on Sunday. It is for my SIL birthday. Will quilt it tonight. She loves turquoise and burgundy. Hav, this is beautiful! Love the pattern and colors. What size is it? Hav4boys, it's lovely! The colors and fabrics match so well! Hav4 awesome quilt, I'm in love with the border fabric! 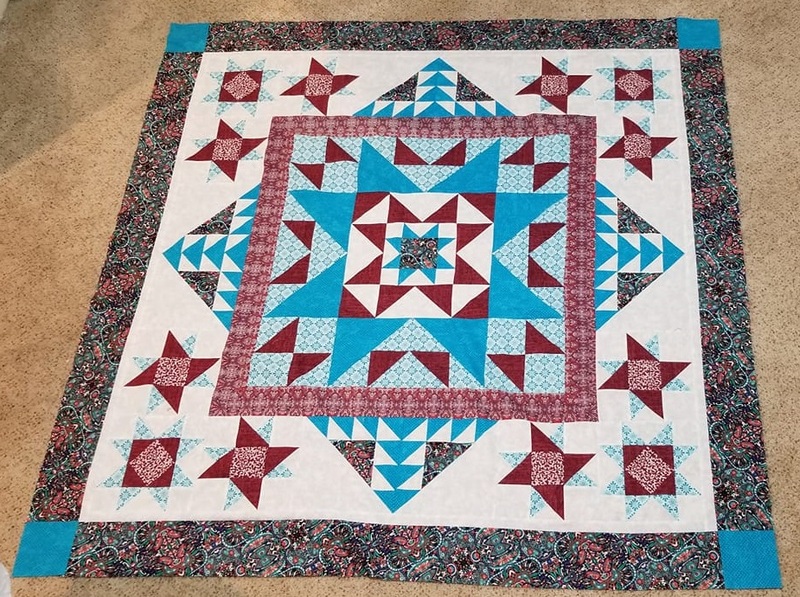 Awesome quilt H4B, red /teal look great together. Several booms back I sent red and asked for teal, still don't have it together yet. that is awesome! I love those colors too! Looks like my package is suppose to be here Wednesday. 6” fresh snow Sunday and 4” more last night. Wow that's a lot of snow! I'd be tempted to stay in and have a personal quilt retreat until it melted. Well, I’m pretty sure this isn’t Mexico. Welcome home!! 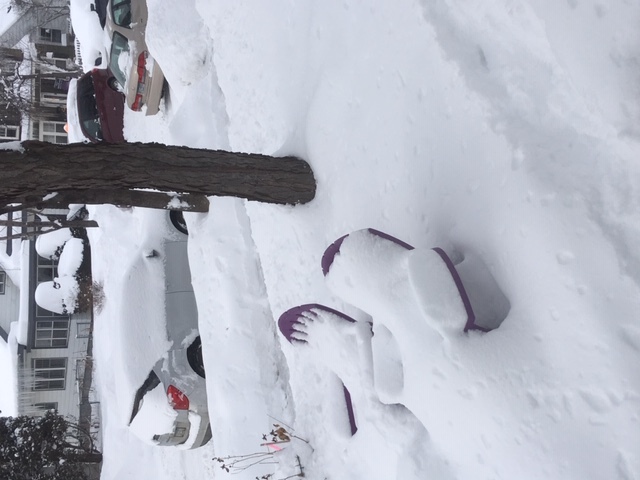 Wow, that is too much snow for me! Such a difference from your Mexican holiday, Terrri.